On this page I used snapshots that I didn't know what to do with. 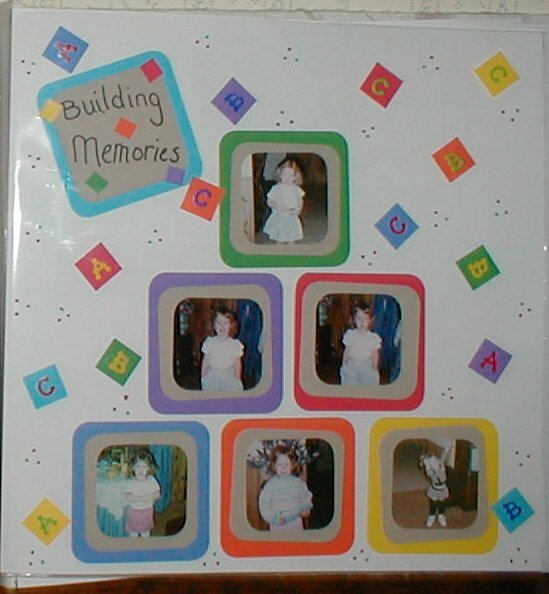 I called it "Building Memories" and made it look like building blocks using colored paper. I cut all my photos the same size. Then the colored paper the same size and then the tan paper the same size. I cut everything into squares, then using my corner rounder I rounded off the points. Again using a marker I added Dots. For the ABC blocks I used a small square cutter and added the ABC stickers on each of them. Using doubled sided sticky tape I put it all together.